Everybody has their own chili recipe… here’s mine! So I’m sitting here, staring out the window at the this dreary day that I know is only going to get worse (they’re calling for upwards of 15″ of snow… joy), feeling pretty bleh, and am trying to think of something to cook that will not only warm my stomach, but also my soul. I need a lift, ya know? Do I want to do soup, maybe New England Chow-dah (I always here my Aunt Gail’s voice when I think chowder, she is Gloucester, Mass through and through!)? How about a nice Minestrone? Then it hits me… Chili! I actually haven’t made my chili all winter, what the hell is wrong with me!? Well, I’m not sure if it’s what’s for dinner, need to get clearance from the wife, ya know… but at the very least I wanted to share the recipe with you. Enjoy! Heat your olive oil on high in a very large sauce pot and add your pork neck. Seared the outside of the pork, then reduce heat to medium and add your red onion, garlic, carrot, bell pepper & jalapeno, sprinkle with salt and cook until the vegetables are sweating. Increase the heat back to high and add your red wine, allow to reduce by 1/3, then add the water and canned tomatoes. Boil for 5 minutes, then reduce heat to low. Cook for 4 hours, stirring periodically. After 4 hours remove the pork neck from the pot and use a fork to shred the meat from the bones. Also sift through the liquid using a slotted spoon to make sure that none of the bones are left in the pot. Add your shredded pork neck back into the pot, as well as the ground Andouille sausage, tomato paste and all remaining seasoning. Cook for 2 hours on low heat, stirring periodically. After 2 hours have passed add your Cannellini, Kidney and Black beans. Cook for an additional 2 hours on low heat, stirring periodically. So that’s it. By the end of the 8 hours you should have pretty thick, meaty chili. Ladle it into a bowl and enjoy! Top it however you like, whether it’s shredded cheddar, sour cream and chives… I personally like to add a bit of freshness by topping it with baby arugula and then some shaved cheese and pita points or crostini. So that’s the story folk. 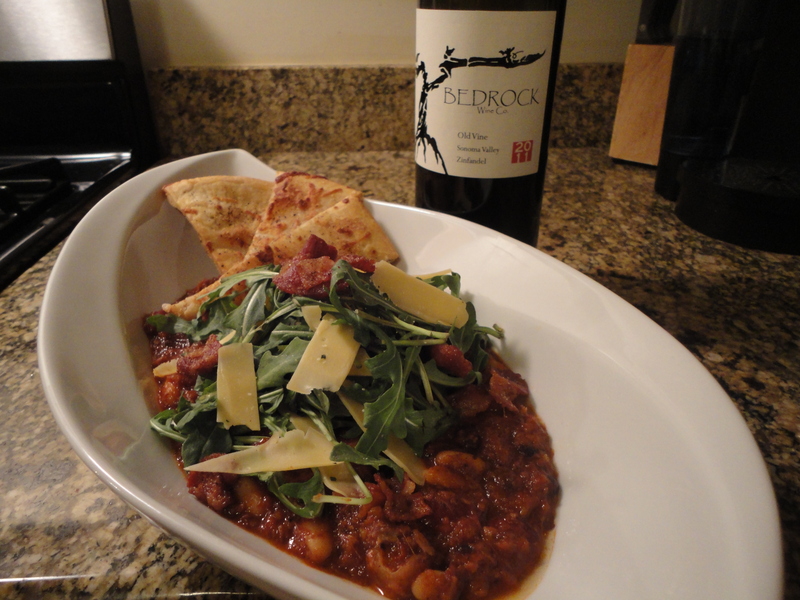 Now you have my chili recipe and what I think you should drink with it. Do what you will! I’ll be writing to you again real soon (especially if there are 15″ on the ground tomorrow), in the meantime crack open a bottle of something awesome and relax. Life is short, enjoy it! Tags: bambino, Bedrock, bucklin, chili, old vines, syrah, tensley, zinfandel. Bookmark the permalink. Previous post ← Citrus, honey & sriracha glazed pork with Asian noodles… recipe and pairings.